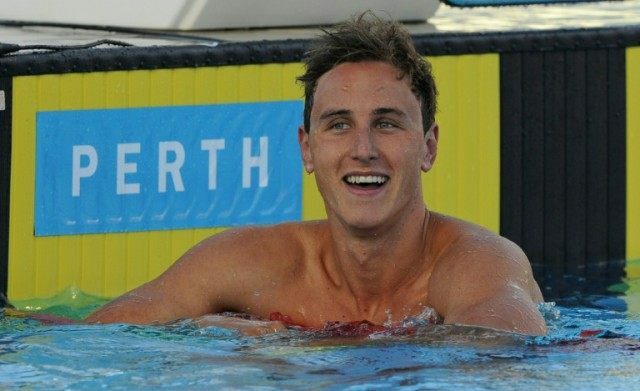 Adelaide (Australia) (AFP) – Cameron McEvoy completed the first-ever sprint treble at an Australian swimming championships with a flying victory in the 50-metres freestyle final in Adelaide on Wednesday. The 21-year-old physics student followed up his stunning 47.04 seconds win in the 100m event and dead-heat with Thomas Fraser-Holmes in the 200m freestyle to power to victory in the one-lap dash at the Olympic trials. McEvoy burned off his rivals, beating Matthew Abood and James Magnussen in a winning time of 21.44secs. McEvoy will now have to juggle a three-pronged individual campaign at the Rio Olympics in August, while London Olympics 100m silver medallist Magnussen failed to qualify for an individual swim at this year’s Olympics. “I was aware of that (sprint treble) and over the past two years I’ve gone close to doing that,” McEvoy said. Looking ahead to Rio, McEvoy said he would be focusing on all three of his individual swims but the 100m would be his main target. McEvoy has been in sensational form at the Australian trials. He overpowered a strong field to win the 100m event in a new Commonwealth record and the year’s fastest time in the event. It placed McEvoy a tantalising 0.13secs off Brazilian Cesar Cielo’s 2009 world record of 46.91secs, making him nominally the man to beat in Brazil. Cate Campbell followed up her win over sister Bronte in the 100m freestyle with an Australian record of 23.93 in the 50m freestyle. Bronte won the other semi-final in 24.27secs, setting the stage for another battle royal in Thursday’s final with her sister. Belinda Hocking trumped world champion Emily Seebohm in the women’s 200m backstroke with the year’s fastest time of 2:06.49, just 0.10secs ahead of Seebohm. David Morgan (51.64) and Grant Irvine (51.76) both failed to qualify for Rio after finishing one-two in the men’s 100m butterfly. Jessica Ashwood missed the Australian record by one-hundredths of a second in winning the 800m freestyle final in 8:18.42. Australia’s swimming team for the Rio Olympics will be announced after Thursday’s finals.